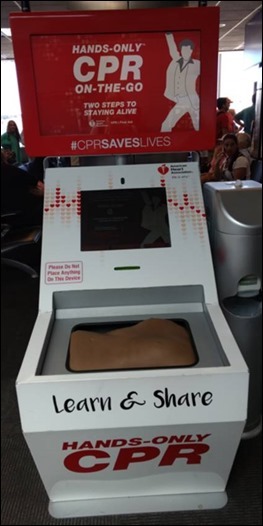 I saw this CPR training kiosk in an airport on one of my recent travels. It got me thinking about how we train people for various tasks, whether in the healthcare IT world or just in general. There has been a tremendous amount of research over the last several decades about learning styles and individual strategies for education. Part of this has stemmed from the recognition and diagnosis of more conditions that require adaptive strategies. Other forces shaping it include various pieces of legislation, such as IDEA, the Individuals with Disabilities Education Act. Most of the discussion in these areas has been around children and young people, however. The body of knowledge looking at adult workers and adult education is still there, although smaller. Some people can absorb knowledge readily from printed material and others need to see a demonstration. Some need to learn by doing, and others by doing a task over and over until they feel they have mastery, especially if they work in a high-pressure environment or one with many distractions. Some people shut down in a group environment, where others thrive in that type of collaborative setting. Others need to learn in a very focused environment with few distractions to do their best. I’ve worked with dozens of healthcare and vendor organizations over the past two decades and have only encountered a couple that seriously considered the idea of different learning styles or learning abilities when creating training for their adult employees. It seems like most training is designed with efficiency in mind – namely, efficiency for those presenting or delivering the content. Another pressure is the ability to track consistently in training, which leads to more packaged offerings. I can attest to the fact that it’s harder to ensure consistency in training when you’re sitting with a physician in his office eating spicy chicken wings while covering the finer points of the EHR rather than in a classroom environment. Sometimes, however, creative strategies are required to ensure that physician makes it to training at all. When I was a CMIO, I had to push for approval to offer training through multiple modalities. Let’s face it — some people don’t do well in a classroom setting and others don’t do well with self-directed learning. Regardless of individual learning styles and abilities, others are going to just goof off regardless of how or where you try to deliver training. I had a boss who loved the idea of conference calls, especially for a geographically distributed organization where managers didn’t want to pull people out of the office. Although some people can learn on a conference call with a couple of dozen people, others find it a recipe for distraction and lack of engagement. My experience is that most adults know what type of training is better for them, and if given the option, they will gravitate towards an environment where they will be successful. In addition to providing training through multiple modalities, organizations have to work hard to make sure that the people delivering training are strong educators, not just subject matter experts. There’s an assumption that is sometimes made that because someone is knowledgeable, that they have the skill to share information with others in a way that is engaging and effective. I could provide testimony from a good majority of my medical school class that found they learned more efficiently from reading course transcripts than from sitting in a darkened lecture hall. These people are now out in our healthcare IT classrooms, and given other work pressures, are looking for the most efficient and effective way of learning material. Due to these pressure, many organizations turn to e-learning options. Some of these are little better than recorded webinars with some questions thrown on at the end. Others are fully-baked interactive sessions where attendees are required to replicate workflows and prove some level of mastery before they can advance. I do enjoy the latter kinds of sessions, although they have to be constructed carefully with the emphasis placed on the right portions of the workflow. I recently QA’d a client training module where the physicians were forced to replicate a complex set of steps around laboratory processing, which wasn’t even part of their workflow. But due to the cost and labor intensity of creating those types of sessions, the organization had settled on a single track for clinical resources, which ultimately wasted the time (and cognitive energy) of many of their end users one way or the other. In all, when you looked at the number of wasted training minutes, it would have been better to put together separate sessions. But since those wasted training minutes fell on the cost centers of the end users rather than the IT budget, the decision was made strictly based on IT resources. I do a lot of work with organizations that are threatening to switch EHR vendors or who feel that their software isn’t up to par. When we actually roll up our sleeves and assess the clients, we find there are operational or training issues at play the majority of the time. Particularly with stalled EHR adoption, a lack of training and/or proof of mastery leads to reduced schedules that never quite get ramped back up or to features that never quite get implemented. Often when we look at causality, we find that providers were not required to attend training or show mastery, even when other users may have been held to those standards. I understand dealing with physician attitudes, but letting them take a pass on training isn’t the answer. The other issue I see frequently is that there has been staff turnover and the new staff hasn’t received the same level of training as others did at go-live, or that they are just expected to try to learn the system during an on-the-job orientation. Often these organizations seem surprised when I recommend what seems like a straightforward solution to ensure everyone in the organization has received an appropriate amount of training. Another area where we help clients is in formulating training strategies, not only on what types of modalities they should use, but also how to deliver the training content in a way that is engaging and includes the right kinds of clinical pearls and examples that will keep the attendees engaged. Sometimes when you’re presenting the driest material, having a good story can make the difference. I’m happy to share my tales from the trenches and let the clients take them as their own. Most smaller organizations (and many large ones) don’t have anyone on staff who is an expert in adult learning and may not have even heard of the idea of differing learning styles, so we’re happy to fill that niche. Like the CPR training kiosk in the airport, we have to strive to meet our students where they are. What strategies does your organization use to maximize training impact? Email me. I sincerely appreciate this article about adult learning and the challenges that must be identified and overcome; especially in healthcare. This list assumes that the presenter of the content is astute at training whatever it may be that they are training. The trainer has a strong grasp of the application along with an ability to present content, recognize the receptiveness of the audience and be able to pivot to meet the 5 rights of adult education in healthcare. I appreciate the article on provider training. My perspective is as an IT person, not clinical. Also I’m specifically referring to large systems in large organizations. There’s an old saying, “pick your battles”. If your shiny new system faces pockets of resistance and efforts to bring those skeptics on-board have already failed, what do you do? This is why clinical holdouts are often simply left to carry on with their passive resistance. As long as they do not overtly sabotage implementation it is the least overall harm to leave them with their beefs. And let’s face it, with the measured satisfaction levels with EMR/EHR systems, their beefs often have a core of legitimacy to them. Another thing. Just because you cannot resolve that conflict now, does not mean you cannot resolve that conflict later. Did the training not get taken, or not stick? You can run another round of training later. Did the advanced workflow or feature not get implemented? You can implement that as version 1.1 or 2.0. Which I note is exactly what you did in your consulting engagements. Still more real-world feedback. When budget cuts take place, training and advanced features are among the first to get cut. Sometimes merely to get system approval in the first place you have to propose a more limited (and therefore cheaper) system. 1). Can we afford this system at all? 2). Does the system add enough value to justify the costs? 3). Do we have enough resources to implement this system? 5). Can we integrate this system with our other systems, where and as needed? One more thing. If you can ever convert a clinical skeptic into a supporter, often those people become your best and strongest allies! Their complaints, converted into positive suggestions and energy to move forward can be a powerful force for good. The only thing is that you must allow them to make changes and find success within the new system and structures. If they perceive that they are getting stonewalled then the whole “convert your skeptics” strategy is sunk.